With this in mind, in this post, we’ll run the rule over seven of the best – free and premium – live chat solutions that are guaranteed to help you improve your online business by letting prospects know they can get in touch with you instantly. Before we dive in to the roundup, let’s quickly take a closer look at why you should offer live chat in the first place. Why Should You Offer Live Chat? Actively listening to the questions and concerns your customers have about your product and responding to them allows you to establish an open dialogue and speed through the consumer’s buying process. By connecting customers with live chat support staff, you’re essentially engaging them with your brand right off the bat. Add live chat to your #WordPress website to increase sales and get a competitive advantage! Convenience. Gives your customers immediate access to a support representative. Cost efficient. Allows agents to manage concurrent chats. It also saves you a bunch on phone expenses. Increases sales. Online chat functionality lets you guide customers through a sale and reduce bounce rates and cart abandonment rates. Competitive advantage. Since many online businesses aren’t offering live chat functionality, it gives you a major competitive advantage. Now that you have a better idea of how integrating live chat support in your website can be beneficial for your online business, let’s go over some of the best live chat solutions for WordPress. 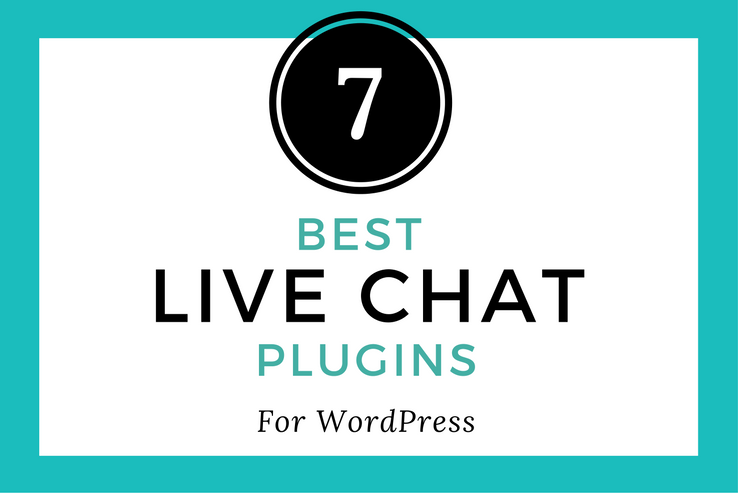 What Are Some of the Best Live Chat Plugins for WordPress? As an online business owner, you’re always on the lookout for ways to deliver better user experience while making sure you stay within budget. Adding online chat functionality isn’t only incredibly convenient for customers but also cost efficient for you. In this section, we’ll run the rule over seven of the best (free and premium) live chat plugins for WordPress websites and highlight the standout features they offer. Tidio Live Chat is a lightweight plugin that enables you to offer live chat functionality through your website. It’s super easy to install and you won’t be prompted to create an account or register to get started. Once you’ve activated the plugin, a live chat option will appear on your site’s front-end allowing your customers to begin interacting with your support staff. In addition to this, the plugin also shows you a list of which visitors are currently online so you can send them personalized messages to initiate the dialogue. As of this writing, Tidio Live Chat supports both English and Polish though more languages will soon be added. The Tidio Live Chat plugin comes in both free and premium flavors. You can test the premium version out for a 7-day trial period and then decide to continue with the premium version or downgrade to the free version. Allows you to view and keep track of online visitors. Customization options for the front-end online chat module. Lets you contact visitors via email when they’re offline. Comes with built-in offline message forms for when you aren’t online. Zopim’s Zendesk Chat is one of the most popular live chat plugins for WordPress websites that lets you answer customer queries in real-time and help ease them into making a purchase. The plugin allows your customers to launch the live chat widget on the front-end whenever they’re ready to begin the interaction. And on the back-end, your live chat support team will be able to manage multiple conversations through the online dashboard. The Zendesk Chat plugin lets you customize the chat widget to fit right in with your website’s design. Its built-in dashboard lets you track user activity and manage chats through a user-friendly interface. Best of all, if you don’t have an online chat support team then you can opt for 24-hour support from Zendesk’s in-house trained experts. The Zendesk Chat plugin is available in over 40 different languages and is compatible with all major web browsers right out of the box. In addition to all of this, it integrates seamlessly with a number of third-party services including Zendesk, Salesforce, and UserVoice. Comes with a mobile optimized online chat widget right out of the box. Allows you to set up triggers to automatically reach every visitor proactively. Built-in analytics dashboard makes it easy to track visitors and usage patterns. Guarantees a 99.8% average uptime. If you’re looking for a simple live chat plugin that’ll help you get started with minimal hassle then the WP Live Chat Support plugin is the best option for you. Once you have the plugin installed and activated, you can immediately begin chatting with your visitors – without messing around with any third-party connections. This feature-rich online chat plugin lets you chat with an unlimited number of visitors at a time through an intuitive user-interface. And as far as customization power is concerned, the WP Live Chat Support plugin lets you modify the text fields that are displayed in the live chat box and try out different color combinations to compliment your site’s existing design. It even comes with six pre-designed live chat box themes that make it easy to get started with the plugin in a few simple steps. The WP Live Chat Support plugin comes with a Node.js message relay server that allows you to optimize your online chats for performance and respond to your prospects at blazing fast speeds. Offers a fully customizable live chat experience complete with animations and themes. Allows you to add surveys/polls before or after the chat session. No Powered by or advertisements displayed on the front-end. Gives you desktop notifications whenever you receive new live chats. Live Chat from ClickDesk markets itself as the fastest live chat plugin that takes live chat functionality up a notch by offering your website’s visitors to interact with you via voice chat and video chat – without installing additional software. Its built-in powerful help desk lets you manage offline chats and emails efficiently and effectively. The standout feature on offer with ClickDesk is that it is incredibly powerful and flexible. It lets your live chat support agents answer the customers’ online chats, calls, and video chats from the separate agent’s panel, the ClickDesk mobile app, or through Google Talk. The Live Chat from ClickDesk plugin lets you send and receive files directly from within the chat widget. In addition to this, you also have the option to store all chat transcriptions and review them later on to improve your marketing strategies. Offers advanced chat queuing functionality to optimize online chat for performance. Allows you to customize themes, colors, typography, and much more. Comes with advanced analytics and reporting functionality. Integrates with third-party services like Salesforce, Zendesk, Sugar CRM, and more. LiveChat is a premium live chat service that comes with a free 30-day trial for users who want to take it out for a test spin. It offers round the clock live chat for your customers and enables you to make the first step by initiating the conversation. And when the chat session is complete, the LiveChat tool lets you request the customer for feedback. When you register with LiveChat, your live chat support agents will get access to the service’s built-in dashboard. From there, the agents are able to manage online chat sessions through a color-coded system that’s designed for speedy responses. In addition to this, it also lets you set up pre-made responses to frequently asked questions so that you’re able to solve customer queries efficiently. LiveChat even comes with some pretty neat features for online business owners. Its built-in analytics and reporting system lets you review the state of your customer service and online chat at a glance by giving you the most important statistics gathered over the last seven days. Offers advanced chat tools such as chat tags, file sharing, and delivery status. Allows you to customize chat window themes, add logos, modify labels, and much more. Comes with powerful analytics and reporting functionality right out of the box. Integrates with Google Analytics, Facebook, Salesforce, and more. Olark is a comprehensive, premium live chat service that covers everything from helping you understand user behavior on your site and offering a high-quality online chat experience. The Olark process is easy to understand. You start off by peeking into your customers’ shopping carts and observing how they’re interacting with your website. This way, your live chat agents are prepared to answer whatever queries come their way whenever the customers are ready to begin chatting. Getting started with Olark is incredibly easy – all you have to do is insert a code snippet into your site and you can begin chatting with your visitors right away. In addition to this, you can also customize the front-end widget to blend in with your website’s existing design by playing around with its themes, languages, color palettes, and typography. Lets you configure custom messages for both online and offline modes. Allows you to set up surveys and polls to get instant feedback. Integrates seamlessly with Salesforce, Zendesk, Google Analytics, and more. SnapEngage is one of the most popular, premium chat services out there and it owes its popularity to the powerful functionality and flexibility that it offers to both users and their customers. Its advanced chat portal combines all the tools you could possibly need to engage, support, and convert prospects into customers. SnapEngage allows you to review comprehensive visitor information and even pulls together useful information about them from their social media profiles. This lets your live chat agents interact with prospective customers on a more personal level. In addition to this, it also lets you transfer chats to different agents or support tiers. In addition to all of this, you can also take a sneak peek at what your customers are typing and configure concurrent chats to make sure you’re delivering an optimal response time. SnapEngage is a great choice for power users who are looking for top-notch online chat functionality to integrate into their website. Lets you send and receive files through the online chat widget. Allows you to customize click-to-chat buttons, chat box, and pre-chat form. Integrates seamlessly with Salesforce, Zendesk, Facebook, UserVoice, and more. When implemented correctly, live chat increases the value your website delivers and can potentially convert interested prospects into loyal customers. Hopefully, you’re in a good position now to identify what you’re looking for in a live chat solution and get started with one of the plugins we covered in this post. If you want to simply test out live chat functionality on your site and see if it works well with your online business then Tidio Live Chat is the best option for you. Those of you who are looking for a feature-rich live chat plugin should opt for Live Chat by ClickDesk. If budget isn’t an issue for you then LiveChat is one of the best premium live chat solutions that comes with everything you could possibly need to deliver a memorable user experience. Have you ever integrated live chat functionality into your WordPress website? Which plugin did you use? Let us know by commenting below! There’s an extensive list of live chat software out there. One of the other FREE live chat tawk.to is worth exploring.